Create & age your very own blend of bourbon whiskey. Or simply use the barrel as a decanter. 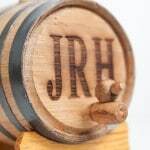 We’ll engrave the face of the barrel with a name, initials or special message for no additional cost! 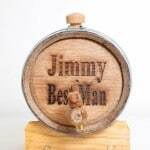 Our Personalized Mini Bourbon Whiskey Barrel has been our top selling groomsman gift for five years. 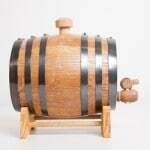 The recipient of this unique gift will become a master distiller from the comfort of his or her own home. 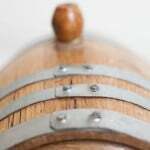 The barrels were designed to quickly dispel the myth that aging spirits should be left to professionals. 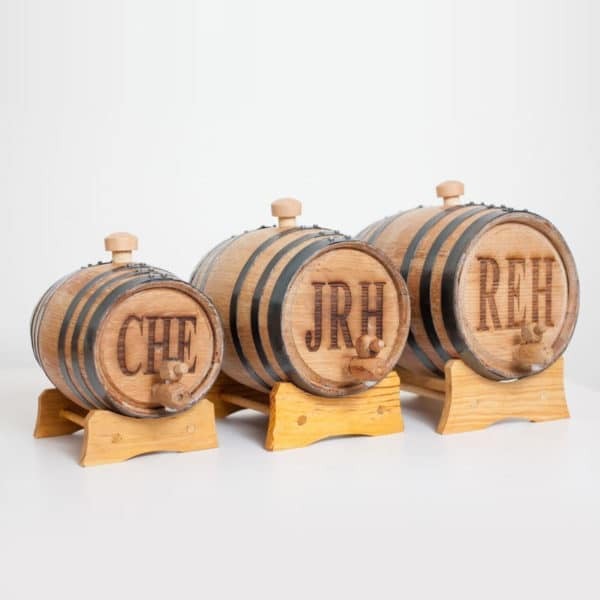 With Bluegrass Barrels, you will fully customize the aging, flavors, and most importantly, the final taste. The detailed instructions that come with each barrel will easily guide you through the curing (cleaning), filling and aging processes. Spirits can age in the cask from one week to three years. Once you’re done with a batch, just empty into a decanter and start something new! 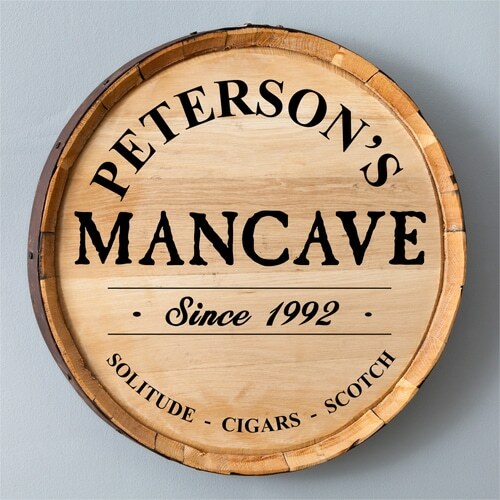 These babies make extremely awesome home décor and are perfect for groomsmen gifts, Father’s Day and housewarming parties. There are a lot of mini barrels on the market but you won’t find any whose quality matches ours. 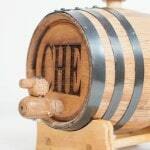 Our barrels are handmade from real Kentucky bourbon barrels — they are NOT vinegar or tequila barrels like you’ll see on a lot of other websites. We take the craftsmanship angle extremely seriously. The quality of our barrels is as high as you’ll see at an actual distillery. If you aren’t 100% satisfied with your purchase or are having trouble getting started, let us know and we’ll guide you through the process or make a new barrel if necessary. 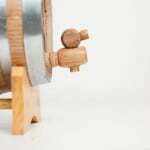 Each barrel comes with a set of detailed instructions, a wood stand, spigot and bung. 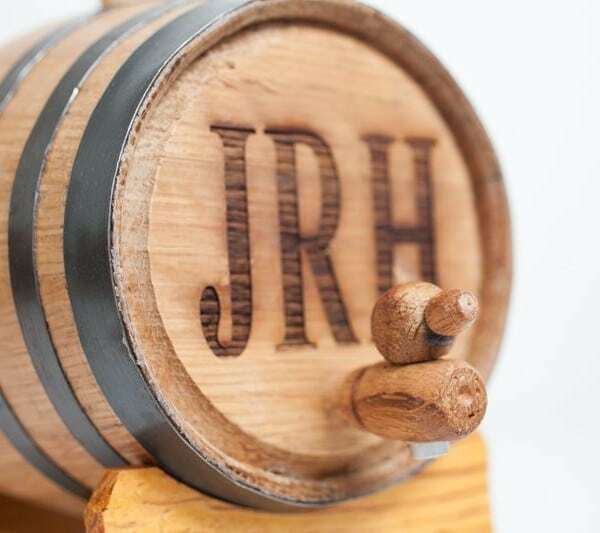 Handcrafted from authentic American White Oak Kentucky Bourbon Barrels. Black steel hoops wrap the barrel. 1 liter measuers 6.5" x 4.5" x 4.5". 2 liter measures 7.5" x 5" x 5". 3 liter measures 8.5" x 5.5" x 5.5". Can also be used to blend and age rum, tequila or wine. I received my barrel but the hoops are loose and/or the barrel is leaking. What should I do? This is perfectly normal for an un-cured barrel. You simply need to perform the curing process that’s outlined in the included instruction manual. This process helps seal up and tighten the wood. Is this a decanter or does it really make whiskey? 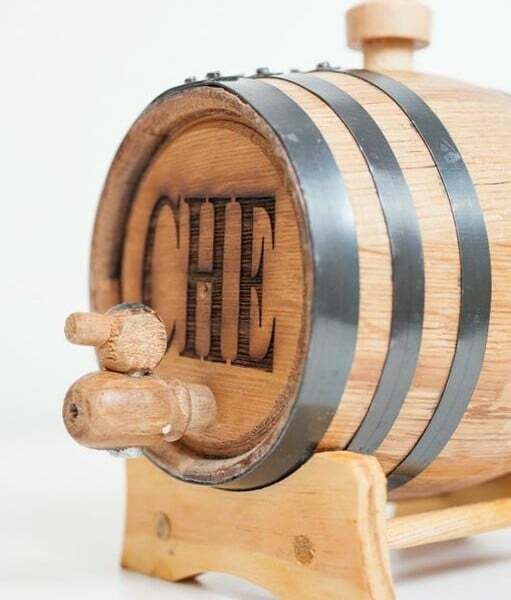 You can use the barrel simply as a decanter/piece of décor OR you can create your own blend of spirit by filling your barrel with your favorite brand and adding extra ingredients. How many times can a barrel be used? What font is used for the engraving? Can you engrave elsewhere on the barrel? 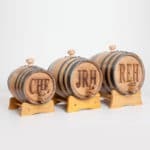 We can currently only engrave on the face of the barrel as shown in the product photos. Does the barrel need to be used right away? 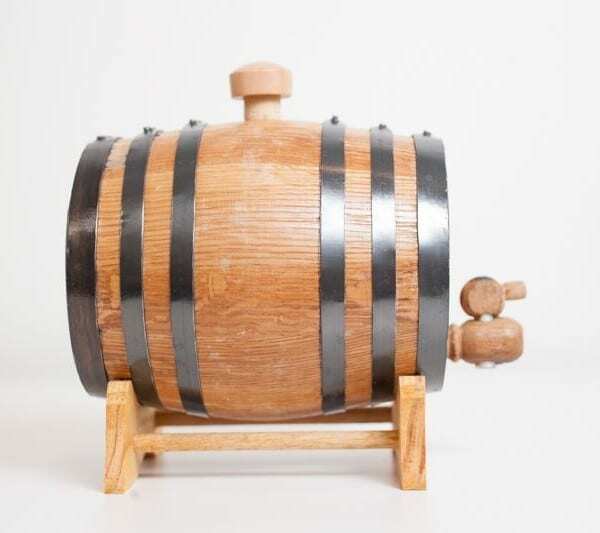 We strongly suggest curing the barrel within two months of receiving it. 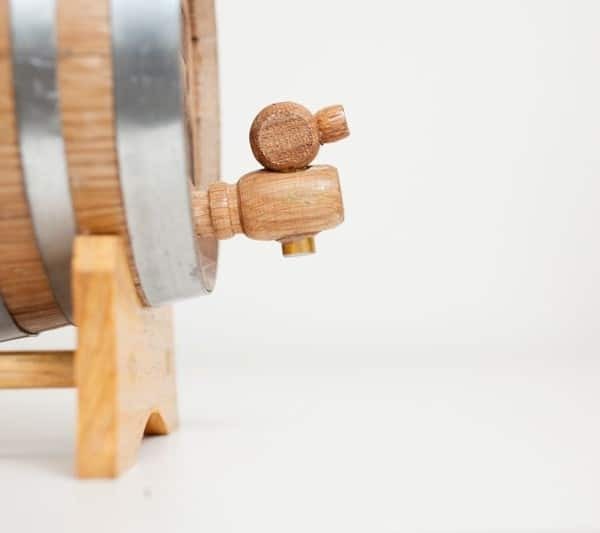 If the barrel sits empty for more than two months with no liquid inside, the hoops will start to loosen and the barrel will start to fall apart. Will my engraving just look just like the photos? The darkness of the engraving my vary slightly from barrel to barrel. 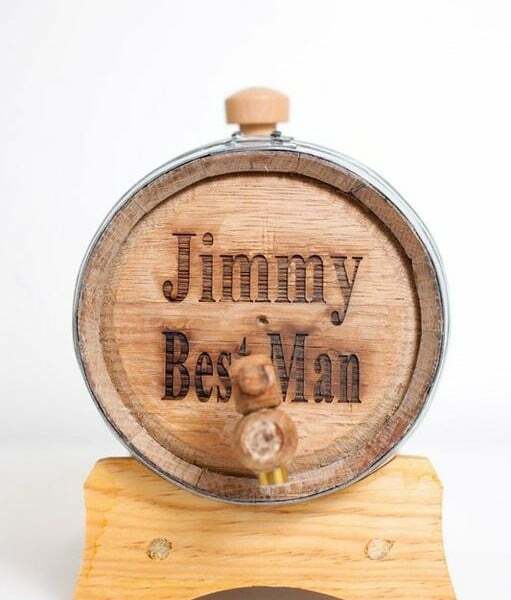 We laser engrave every barrel at the exact same depth/power. However, since our barrels are made from real used bourbon barrels, there is no way to know how hard each individual piece of wood is beforehand. Engraving on harder wood my show up slightly lighter. With all that being said, we take pride in every barrel that leaves our shop and know that you will appreciate the quality! What is the small hole in the middle of the barrel face? This “dimple” is part of any bourbon barrel (both full size barrels like you’ll see at a distillery and mini barrels like this). 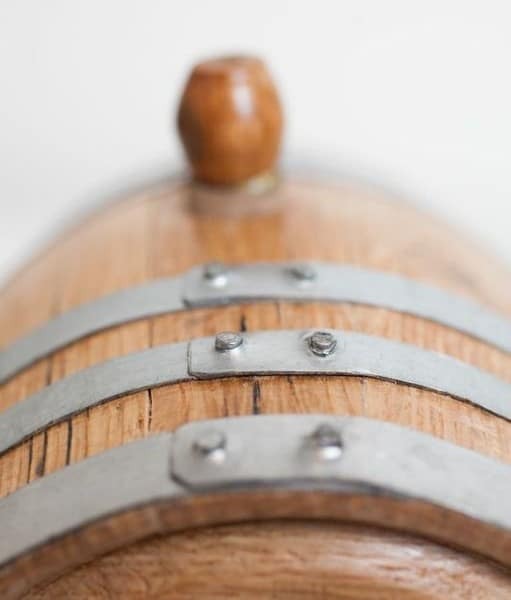 The dimple is an integral part of making sure a barrel is balanced while being constructed. Sometimes the dimple will appear within the engraved portion of the barrel while other times it won’t interfere with the engraved words at all. There is no way to predict where the engraving sits in relation to the dimple and it’s not something we can change the location of. Because it’s a natural part of the barrel, we cannot issue refunds or replacements due to dimple location. 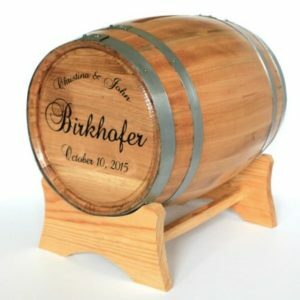 Ordered one for my in laws as a gift and will be definitely ordering one for our bourbon collection! Shipped quickly and was better than I anticipated! Absolutely stunning. We got one for my dad and ended up buying a second for my stepdad who also loves bourbon. Now we need to get one for ourselves! Exquisitely engraved. I cannot wait to give to my fiancé for our wedding. Fantastic product! I've ordered 2 of these over the last 2 years the first was perfect i got for my father so I ordered another this year for my husband. I had some problems with it and got in touch the man registry and they got back with me in a timely manner and took care of it right away. Definitely recommend to everyone! Great customer service. Such an easy transaction even though I forgot to give all the personalization information needed. It arrived just in time for my husband's birthday!